[01:02] and he is the founder of purpose on the limited and I got a great story to tell you about how I came in contact with Jim and how important he is in my life as a mentor, as a, as a dear friend. And I was so glad that he just said, hey, yeah, I'll get on your podcast. So, but before we get on with that, and before I make that introduction, let's get going on with some good stuff that we need to be aware of. Okay. Tailgate talk number one. Okay. If you've been following the industrial talk podcast, we've been talking about, uh, the industrial academy and uh, for me personally, fortunately I come in contact with a lot of great industrial professionals, uh, anywhere from leadership all the way through to technology and everything in between. And so what we're doing is we're creating a well and in an industrial academy that we're going to highlight and you can go out there and you can get some training on some of the best industrial specific training out there. [01:59] So it's all broken up into, let's say, leadership, a finance operations of course sales and marketing, which I'm so passionate about. And then the final one is technology. So please stay tuned. It's coming around. Number two. Alright. Books, books, books. We always got to keep on learning, right? We always got to keep on learning because if you don't, your competition is going to learn. So this week's book, and I'm going to be interviewing this gentleman, not next week. He's going to be highlighted and his name is Steven. Steve Miller right there. If you're out on youtube, you can see it on copyable. How to create an unfair advantage over your competition. Not a bad read. Easy number one best seller on Amazon. That's right. I'm going to be putting him out. He's, he's been on the podcast, but once again that's unconscionable and that is a Steve Miller. Go out there on Amazon and it's great. [02:52] Read. Very well done. Steve. Number three. All right. Food, right? All about industrial approved food. So I went to a place called Acme Oyster House and if, if, if you've ever been to New Orleans or part of Louisiana, Acme Oyster House is a, is a, you know, restaurant that provides oysters and then of course all the other, a cajun, you know, South Louisiana Fair, one of the things that they have and that you've got to put on your bucket list and that is grilled oysters. Now you're going to say, oh gosh, I don't like oysters there. Uh, they're this or that. I'm telling you right now, grilled oysters will way to go. I'm just telling you, man, it's drenched in butter. Parmesan cheese and whatever else, magic that they put on it. But I gotta tell Ya, if you come on down here, you need to be a part of that grilled oyster family and, and there are other places, but acne is where I've been. [03:48] And I take some pictures and it's out there. You can see it. Okay. Onto the interview. Once again, the story that I have with Mr Jim Witt here, as you can see if you're out on youtube, the I was running this company, he was a keynote speaker and what made him so spectacular and what made him so special, what made him transformed my life and, and, and put into perspective the necessity for purposes that purpose unlimited. He talked about purpose and I and I just realized at that time, and this was many years ago that unfortunately I didn't have a purpose. I didn't have really any clear distinction. So you're going to hear about Jim Witt. He's a published author. He's got a couple of books writing for the brand, which is a great book. I highlighted it in my newsletter and then the other one is of course, this one right behind me if you're out there on youtube and that's a finding and fulfilling your purpose in life. [04:42] And this is the transformation, transformational power of purpose. Great Little workbook right there. 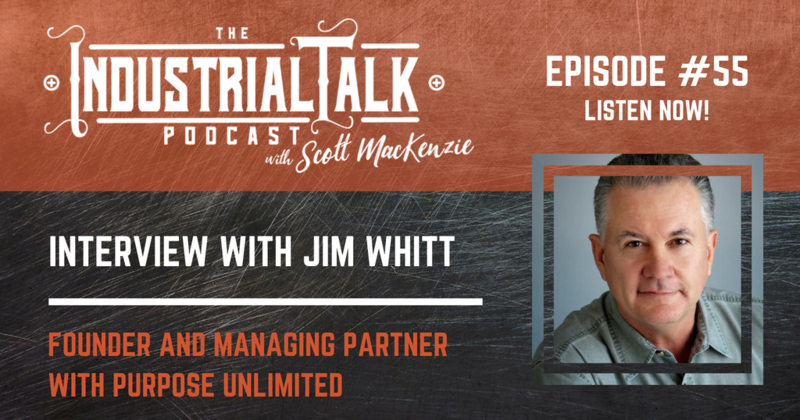 I went through it and, um, nonetheless, as Jim Witt purpose unlimited, it's going to be a great interview and, um, we're going to highlight him more and more just because I believe just in business alone, you need to have that clear focus in that organization that is driving to a purpose, right? So nonetheless, this Jim Witt, dear friend of mine, incredible individual, so enjoy and, uh, I'll be back on the other side. All right. Uh, welcome to the industrial talk podcast. Thank you very much for joining this interview. This interview comes from the heart. This interview is something that is very special to me. This gentleman has been a key motivator in my life, a mentor. And uh, when I reached out to him he said yes, which was a quite humbling quite frankly. And uh, he is the founder of purpose unlimited and he helps people and businesses reach their full potential. And I just want to give just this open hand gratitude there. 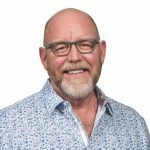 Jim Witt, welcome to the industrial podcast. Thank you very much for being here with us and the listeners. [06:02] You just made my day with that introduction. Thank you very much. And uh, now we're going to wrap it up because I don't want to go downhill from here, but no. Well, and you know, uh, we met, I can't remember the last time. You probably have a better understanding of what, what, why you impressed or, or impacted my life in such a positive way is that you were the first individual that truly communicated to me about the importance of having a purpose. And then from that point on gm, everything that I do, everything that I try to start, everything that I contemplate starting always starts with a purpose. And I think the listener needs to know how you came about and how you started this company purpose unlimited. [06:50] Well, it all started because I was searching for or something. Uh, I had spent 10 years in sales with Ralston Purina company working with a large commercial feeding operations in the high plains of Kansas. No Coleman, Texas. And uh, I was a successful salesperson, a top 20 producer out of salesforce for $500. And, uh, but after 10 years of that, I, uh, I felt like a bad engine that was hitting on about four cylinders. I, uh, I knew I had more ability than I was using more potential than I was using and I didn't know what I was going to do, but I knew what I wasn't going to do that anymore. So I quit my job and I went to work for another large agribusiness corporation, a central soya, and I became their national cattle product marketing manager. And after about a year and a half, I took my product group from being the forest performing group to have the largest percentage increase of all the product groups in a years time I still felt like I was a v eight engine hitting on about four cylinders. And so I, again, I didn't know what to do, but I knew what I wasn't going to do anymore. So I quit my job again. [08:15] I quit my job, but I was getting good at being unemployed events. Your wife like that, didn't she? The story gets better from here. So. So anyway, I came up with this idea, I called up a couple of old feed yard customers are buying commercial feed yard customers in Kansas and I said, hey, I've got this crazy idea about to work with you guys. I'll be contract marketing work for you. And at that time nobody had ever done this. This is back in 1988. Uh, you know, because of the industry was still only, you know, about three or four decades old and had not completely yet. So these two great friends of mine that owned and ran these car and said, yeah, we'll give it a try. So after I quit my job, my wife a bit bloated up our kids and, and drove back to Oklahoma because we were living in Indiana now and the company headquarters or central soya and I discovered they do not speak Okie in Indiana. [09:20] So we needed to move or we're going to have to hire an interpreter for our children. And she, she called me one day. I still was finishing up my, my tour there in Indiana and she said she was looking for a place to live. So she's starting to with folks and she said, Jim, she says, I think I found this house. And I said, really? And she goes, yeah, she says it belongs to fill us in. Oregon will fill us in a word or a friends of her folks and they, they had a farmhouse out in the country and I've never seen this house before. I said it was on the state line, the Kansas, what moment? I mean literally on the state line. And I said, well, I don't recall this house. I said, why don't you describe it to me? And she goes, well, she said, it's livable. [10:08] I need some information. I said, what are they going to charge us for rent? And she said, nothing. That answered all my questions. The price was right and yeah, yeah. So I jumped in my Chrysler, New Yorker, Fifth Avenue and drove 14 hours back to Oklahoma, spent the night with her folks, and the next day we drove over to take a look at this house. We're gonna live in for free. When I pulled up into the yard and I saw this house, it gave new meaning to you get exactly what you paid for it and you remember the TV show green acres. Well, this, this place was worse than green acres. Mercy. Mercy was an old farmhouse. It had the asbestos siding. I don't Scott deal. Absolutely. It's a lovely citing. Yeah, because you remember you. You throw your baseball against it when you're a kid and then crack and fall off and say you had a big holder. [11:11] It was had a hip roof, green shingles, half of them are blown off and this house was so old. The roof is sagging, the forks was sagging, and when I stepped up on that porch I would say, but I'm a positive thinking person because I've lived ziglar and you can't help get pumped, man. I'm telling you. Right. I understand. So I said, it's got to be better on the inside. I was wrong. The ceiling caving in from more of the roof and lead. It was heated with a wood burning stove in one propane wall furnace. The plumbing was rusted. You turn on a faucet and nothing would run. Then I walked into the living room and um, the living room looked like the inside of a box car. It was a long narrow room. And in the middle it had a slope and the floor. Now anybody that ever grew up in an old farmhouse, when you add it onto the farm house, the foundation would settle differently from the original foundation. So what happened was, is you had the ski slope in the middle, but somebody had taken care of that they covered up with carpet, must've been about 1970 because it was the ugliest green and orange shag carpet you've ever seen. He probably borrowed it from my mom. [12:30] We just happened to have a, a couple of slabs of that. It was designed by somebody on a bad LSD trip. Lovely. It is. So I now remember, I've quit my job to start a business that's never been done before. And as I'm standing on that green and orange shag carpet, the two by four reality and these square between the eyes. And I thought, what in the world are you doing? You've quit your job, you're moving your wife and two kids and a shack to start a business. It's never been done before, so I turned to my wife. Now remember, she's the one that picked this house out and I said, have you taken leave of their senses? I said, do you really want to live here? And I'll never forget what she said, Scott, because I was expecting it or say, oh no, I was off my meds that day in my right mind. [13:26 ] I realize what a terrible mistake this was, but that's not what she said. She said, Jim, we can live here. Temporary temporary turned into 18 months. The longest 10 years of my life. During which time I got a master's degree in Murphy's law. Everything that could go wrong did go wrong at the worst possible time. After six months, my business was a failure. I was also in the cattle business. I've lost $30,000 a feeding cattle and I went into a state of depression and I don't get depressed. I mean I'm, you know, I'm, I'm, I'm almost positive thinking person. He changed my life, my friend. Well, what I went through after what I went through, uh, you know, you, you, you always say, be careful what you pray for it. You might get it, will always wanted to know what real faith was. Well, I got to find out every morning I'd get up, I was so depressed I'd get up my national myself. [14:27] Two questions. How, why did you do this and how can you be so stupid? Yeah, everyday. And uh, I didn't know what to do. And then one day I was sitting by the, uh, the wood burning stove and I was sorting through a bunch of old files of mine and the ones I'm wanting to keep three back in a box and ones that wanted to get rid of the fire, which kept me warm and busy, opened up a file folder. And inside my file folder was a yellow legal sheet. And at the top was written a date, March 20, first 19, 88. And underneath that date was written the question, what is your purpose in life? And I recognize these as notes that I had taken from a seminar a year earlier when I was still gainfully employed and whenever I saw those notes, my mental dvr cranked up and I had a flashback because when I was in the seminar and I was asked that question, here's what I thought. [15:27] I was going down the road out in western Kansas and a young salesman was ride with me and uh, he was a sharp young guy, graduate New Mexico State University and uh, but he never worked in a feed yard before. And he was frustrated because you'd call on those old feed yard managers and they show you up and spit you out. They did their very best to run you off, make sure you never called off again. So he looks over at me and he says, Jimmy says, I don't even know what questions to ask a feed yard manager on the first call. And I said, well, my good grief, it's not that hard. I said, get out a pad and pen and start writing. And you know, this is before we had computers and laptops and everything. So he's writing this to write down pad and pen and I've going, I don't know what those are just for the younger viewers. [16:17] So we're going down the road and he's writing down all these questions that I've never written down myself and I never thought anything more of it until two years later when I left the company and I resigned the day they gave me my 10 year service award, my cross pen and pencil set. Do you remember the cross cutting cross made a living office giving those things out, man. So anyway, Mike comes up to me and he says, I want to thank you for something. And I said, well what's that? And he says, I still have the 10 questions that Jim went, gave me to ask a feed yard manager on the first of all. And, and right then my mental dvr stopped and it freeze framed on his face. And I'm looking directly in the Mike's eyes. And you know, the eyes are the window to the soul. [17:08] Absolutely. And when I looked into his soul, here's what I saw, I saw the tremendous potential this young man possessed. And I thought, you know, he just needs somebody to help him get there. And I looked down at the answer that I'd written a year earlier to the question of what is your purpose in life? And I had written my purpose is to help people reach their full potential. And right then it was as if God spoke directly to me and said, Jim, you figured it out. You know, why I put you here. Focus on this and watch what happens. And Scott, it transformed my life. And I tell people you've heard me speak because you're in the were in the audience years ago. And I tell people that they're looking at somebody and old cowboy who grew up in the cab business, old feed salesman who has traveled around the world as a consultant and speaker, written three books, written hundreds of articles on leadership motivation and change it. Someone who's considered to be an expert in their field. And um, just as amazed about it as everybody else because I really don't consider myself to be anything but an ordinary person. [18:51] you know, I got to tell you that the gym, I can't say that my story is similar, but when you came in and you spoke to the group and I think it was in Houston and uh, and that was a moment of time when, when I was just sort of in essence floundering, I, you know, you do this, you do the things that you think you're supposed to be doing and you just sort of go through that routine. And, and once again, to use your analogy, I was running a probably on four of the eight cylinders and then it was that Aha moment that, that truly in it doesn't, you know, your life is not, you know, a bunch of popcorn and candy after awhile. I mean it's still work, but there is that, that it's different. It's, it's different about how you view things is I, I dunno and purposes is just been a big driver for me. [20:26] if you're out on the youtube channel looking at it. Here's the book right there. Now that, that's my other book. No, no, no. If you were getting there, that's one of them. That's just. This is how important is like the transformation power of purpose. And I and I went through this book too as well. It was just easier to grab it posted. [20:47] Oh, well, here I happened to have writings for the brand. If you're out on the youtube, there it is right there, and you've got the other one here. The thing about it is if you're really a poster child for the processes that I've developed, you're a testament to, and I tell people that I can't tell you what's your purpose in life is, but I'll give you a shovel and tell you where to dig. And that's where I, I wrote this book. That's the process. If you want to discover your purpose in life, you work your way through that book and you're going to discover your purpose. The only prerequisite is that you have to be looking for it. You have to be seeking it. And of course if you seek, you will find. And uh, so I, I tell people that I can't tell you what your purpose is, but I'll, we'll give you a shovel, tell you where to dig in. You have to find it. You don't define it. You were created with that purpose. And when you discover what your purpose is, your life becomes electric and look at you, look at what you're doing today compared to when I met you. Yeah, that's been a journey. Hasn't. [21:57] Would you have dreamed that you'd be doing what you're doing today? No. Heavens no. Having your radar screen, was it? No. You know what's interesting about that there jim was the fact that I was sitting in the car and I was just driving. I said, yeah, I can do. I liked the people within the industry. I love what they do. I think it gets transforms people's lives. Yet I can't find a podcast that has anything to do that highlights and really elevates that procession of profession to what it needs to be in and and yeah, who, who have thought that, here I am chatting with you on a podcast. It blows my mind, but I'm going to have to break right now and I hate to do this there, Jim. You're listening to the industrial talk podcast. We're going to go into how the power of purpose not only impacts the individual, but from a company perspective and why you as an industrial professional need to really listen to this, this gentleman talk about it because it will change your life. So stay tuned. We will be right back. Thank you once again for the uh, listening to the unjust industrial talk podcast. You're listening to the industrial talk podcast network. [24:30] say, God given noble purpose, nothing stops. Shes. So Jim, let's, let's start venturing into how we can get some tangible action out of this. Some content that the listeners can truly benefit from and how the, that power of purpose can really in essence transform businesses. Well, let's start by addressing your listeners that are in the industrial world out there. You know, a lot of times we think of a industrial is being blue collar jobs, right? [25:07] Huh? You gotta stay with it. As I take a Swig, when you give me a question, he asked me a question. Well, when I'm trying to clear my throat. Yes, go ahead. And I'm going to share a story out there because I think way too often we think of, of jobs as we got these low level jobs out there that really it's just kind of grunt work and then we've got these high level jobs out here. You know, we're all one and that these people up here are important and these people down here aren't important. And I want to share a story with you because I was asked to speak, uh, for a national trade association the last a few months ago. So I've got the CEO and a couple of his senior staff members on the phone with me. Of course, I always call them up and we do our pre programmed prep before I've written one speak. So my parting question was, is what do you want your, your people walking out of the meeting after they've heard me speak? [26:06] What do you want to thank you? And I mean, he said immediately says, I want them to believe and understand what they do is important and I thought, you know, that is powerful right there. That's good. What if everybody in every organization understood and believed that what they do is important? What kind of an impact would that have? It would be huge. So you know, I went and I spoke and I shared this story with them about my friend Kent strong. Now Kent grew up in southwest Kansas and his dad was in the manure business and what his company did is they go and they each break these pens and feed yards like the loaded up on trucks. They take it out and like spreading farmers' fields. So Kent grew up working in the manure business doing that all of his life and anyone off the. [26:59] Then he went off to college. And so when he goes to college, she started to think about, well, what am I going to do with the rest of my life? Well, during the summer he'd come back and work in the family business again. And he said, one day he, he got to thinking about what he was doing on any thought, you know, I'm not just out here Holland and spreading manure. He said, I'm helping feed the world. Now you think about that. That's an epiphany because when they scrape those pins, what happens is as you take mud manure out of the pins, the cattle are in a better environment. They perform better. You take the manure spreading on the fields, it's the most perfect fertilizer that you can have. Your putting organic material back out on the field. So you increase, you increase yields on the crops. [27:48] So that is the ground floor of the food business right there. So kit came to the realization that he was feeding the world, not just hauling manure, he's feeding the world. Now let's ask the same question for everybody that's listening to this podcast out there. What if, what if you could help everybody in every job in your organization understand that they're not just out there turning wrenches and, and, and, uh, you know, whatever. Yeah, yeah. But what they're doing is actually important. And so what I did, and by the way, can't on that day determined that he would not do anything in his life that was unimportant. Now that's critical for young man. It's just a. But you know, years ago I'd have people would call me on the phone or I'd have the conversation with them on an airplane, you know, what do you do, what do you do? [28:48] And I would explain to them how I help create purpose driven organizations. And they had no idea what I was talking about because you know, the purpose of businesses to make money, you know, we got to reduce expenses, raise revenue, you know, you use all of the, the, the, the corporate lingo, right? Right. But you know, what people care about. So I told them I'd start telling them how I helped create purpose driven organizations. They just didn't get it. So I thought, you know, I've got to figure out some way to help them understand this. So that's why I wrote this book. And it's riding for the brand. The power of purposeful leadership, which you've read. Of course. Absolutely. And it's a western that takes place 30 years into the future, and what I did is I wrote an allegory about how this rancher who's going broke and an Oklahoma discovers his purpose in life is to a hungry world, and he builds an organization that recruits partners to partner with him in his purpose and he builds the world's most successful organization by doing this. And there's four principles involved in this. The first one is purpose. If you can't, if no one in your organization can tell me what the purpose is, word for word, then you don't have one. If nobody can tell me what the purpose is, you don't have a purpose. And that's after. That's at the organizational level, at the organizational level. And by the way, you can do this at the departmental level as well. [30:21] Number two, you're not going to achieve anything of greatness by yourself. You have to have partners in that. So the second principle is partnering. The third principle is pioneering. And you know, you were talking about something before we went on the air. We're talking about change. Everybody is dealing with change and struggling with change and so that means we have to be in a perpetual situation of pioneering. We have to pioneer new ways. We have to play what if, what if, what if, what if we have to be constantly pioneering and the fourth principle is profit. If we know what our purpose is and we have people that want to be partners in our cause and we pioneered with them, guess what's going to happen? You're going to now and the exciting thing about it is, is you're going to build a company that becomes a people magnet where people want to come to work for you because they want more out of their work than just a paycheck and a pension and benefits. They want to be partners and a cause that has a really adventurous and idealistic. And you know in the old west, if you went to work for a ranch and you did your work well and you were loyal to the ranch and if need be, you fought for the brands, then the highest compliment you could ever be paid was, is you ride for the brand. And so what I help organizations do is create a culture where people want to arrive for their brand. [31:52] How, how long does something like this? I mean a company might be listening right now or, or a manager or director of VP, whatever it might be, listening to the podcast right now, what would be the first step because that, that, that makes sense. Don't get me wrong. It makes sense. It's that sustainability. Is that a, uh, the purpose and driving that purpose start at the top? [32:17] Oh, absolutely. If they owner or the CEO or the department head who were arrested, if they don't believe in it, who else is gonna believe in? Yeah. They ones that say, okay, this is what we're going to do. A second thing that you have to understand is the organizational development is not an event. It's not going to a seminar. It's a process. You have to work on it every day, every day, every day. And so what I did with clients is I introduced them to a process, which again is outlined in my book, writing for the brand and engaging in them in that process. We looked 30 years into the future and we asked the question is, well actually I asked him to look 30 years into the past first because if you look back 30 years ago, how many changes will be experienced in the last 30 years? [33:05] You wouldn't be doing this podcast. The years technology did not exist. So I asked them to look 30 years into the future because if you do your planning three to five years, well that's nothing and that's why I always tell people that if your. Your idea, strategic planning is three to five years, remember that all of those companies that were too big to fail, that failed in 2008 had entire strategic planning departments and they all went over the edge of the cliff at the same time they did because they really weren't planning for the future. They were just trending. They were simply continuing to do what they had done in the past. Only more so, which mean that just drove them off the cliff faster, so real change takes a generation to achieve. So I asked them to look 30 years into the future and say, okay, what's the future gonna look like? Then the next question is what are we going to have to look like if we're going to be part of that future? And then the final thing is, is what are we going to have to do to get there? And that's the whole process that helps them identify what the purpose is, what the vision is, what the values are, everything that goes into what we have to do to create this company of the future. [35:02] how do you, how do you change that? Well, as publicly held corporations, I did long range planning is 90 days from quarter to quarter, and it's all based on what a stock analyst projections is that they're stopped. So they're. They're trying to hit a number, which is a terrible way to run a business because what if you overshoot the number of the guests, watch your stock goes up. If you understood the number, you're stock goes down, but you're only talking about three months, four months, well actually three months. There's four quarters there, so you have to reach out and say, look, we're, we're talking about what the next generation is going to look like. Now you and I both know companies that do that to some degree, the republic or they're privately held companies. Cargill for example, or coke for example. You know, they don't look at it from just a 90 day perspective. They look at it longterm. Both of those companies are pretty successful, so I try to get all of my clients to do exactly the same time, feel 30 years into the future, stand there, look back and say, oh, this is what the future looks like. Now. Let's build a bridge from here, back to there, and then work our way forward. Do you ever have to have that conversation, Jim, with that, a big thinker, CEO person at St Ann and and have that conversation saying, you're not getting it. [36:30] Tinder conversation, Scott. Here's what I learned. The great thing about writing my book, writing for the brand is when someone says, well, what do you. What will you do for us if we hard to do as a consultant? I said, read this book. If they don't read the book and disqualifies me, read. Yeah, so if they. If they read the book and I get a lukewarm response from them, then it disqualifies. If they read the book and they say, you know what, I read what you wrote and that's the kind of company I want to create. Then I say, we got a place we can talk. So I've learned to qualify my clients. Scott, I'm not for everybody. There are some people that think I'm a heretic, you know, I show up and speak at meetings, carrying a rope and a shock collar. We're in a point yet I'm not for everyone. I'm only for those people that really want to do something that is radically different than what we've done in the past. And that's why for any company to succeed in the future, they are going to have to do things radically different than they've done in the past. You know that because that's what you're doing in your consulting business. [37:44] Yeah. Yeah. And You bring up a good point there, Jim, that the reality is, is that even back 10 years ago, I don't think change happens as rapidly as changes happening today and in the industrial world as, as I look at it, the technology is blistering fast. Things are changing more with less, whatever it might be, and I'm more so than ever you can lose track of what is important in your company because you're just constantly trying to keep up with the latest and greatest and I think it's, it's, it's more important today than it has he been and I think you've got to be grounded in something that is, drives you in such a way that as it's above the noise because there's a lot of noise out there and if you're not willing to, if you're willing to, to commit to that, that, that, that is a challenge and I think it's a, it's a blue ocean out there for you. [38:40] Well, fortunately, you know, I was doing purpose when purpose wasn't cool. You know, Dan Pink's book drive or before Simon Sinek wrote his book. Actually that's validation for everything that I've been doing for 30 years and Dan Pink is a, has done a great job of distilling that all down from a research perspective and thank God for people like him and Simon Sinek start with and it's now purpose is popular. I read an article the other day about the CEO of weight watchers and the Lady's name, and I forget it right now, but she, she has created a purpose driven culture at weightwatchers and that's what I want to see happen. I want to see a world where every organization is driven by a purpose that is positive, powerful people and serving, and I want to see every individual that comes to work in that organization. Not only want to partner in that purpose, but I want those individuals to discover what their purpose in life is, and when you connect the dots between those two things, you have engagement and now all of a sudden performance goes up, morale goes up, absenteeism goes down, sabotage goes down, turnover goes down. [40:11] Everything that should go up goes up, but it's a byproduct of creating that culture and millennials. You, you bring up millennials. Everybody complains about millennials and you know my, you know, when my generation was the young generation, guess what? The older generation complained about us at just what people do about succeeding generations. Yep. Here's the cool thing about millennials. Millennials get purpose. You know, they're not just driven by how much money they can make or they're not looking to go to work for an organization just so they can get a gold watch after they retire. They're there because they want to make a difference. So if you create a purpose driven culture and you can tell them specifically what that purpose is and they say, Hey, I want to be your partner in that cause, guess what, you'll attract all the millennials that you want and those, those millennials are sharp. [41:13] You need to process information and make decisions and move forward. Is, is staggering fast. Yeah. The, we have to learn technology from them because, you know, we're old dogs. They're a young adult.Yeah, absolutely. Hold onto that thought. We're going to be wrapping it up. Stay tuned. We're going to wrap this conversation up with Jim Whitt. We're talking about purpose and you know, one of the things that I always remember Jim and, and uh, because of you, I never thought of it this way, but I always referred to as Mother Teresa and her sole purpose was to love the unlovable. Right? And she changed the world she did to just change the world and there's plenty of examples out there and it was definitely the giving of yourself in such a way that it just changed yourself. So anyway, hang tight, everyone. Appreciate it. You're listening to the industrial talk podcast. We will be right back. Hey, once again, this is Scott Mckenzie with industrial talk. If you like what you listening to, please feel free to sign up for the free podcast as well as the blogs. I'll try to keep it all relevant to your business and hopefully be able to provide some insight into what we do at industrial talk and what you do as a professional. I hope to see you soon. Thank you. All right, welcome back to the industrial top podcasts. Thank you very much for being with us. And we're talking with Jim [inaudible]. He's got some books out there. He's got some stuff and we're going to wrap this segment up. A gym. [42:44] I am so moved by your purpose, by what you do and your, I guess just energy to be able to continue to, uh, communicate the necessity for purpose. And you have a course, the programs and all that. So the listener out there wants to get ahold of Ya. Tell me, tell me how they can get ahold of your gym. Well, they can go to purpose unlimited.com or they can go to gym Witt.com and either one to get us there. Uh, I give you a phone number if you want a phone number or just as long as you answer those emails if they come your way. And I think you're out on linkedin too as well. [43:25] Yeah, I'm on Linkedin. I'm on facebook. They can follow me on facebook. Linkedin. I post a quote a day, which you see, that's another office. Yep. And I'm not as prolific as Scott MacKenzie is posting on Linkedin who I want to be whenever I grow up on Linkedin, linkedin and instruct Scott MacKenzie is thing I've competed against other companies. I'm trying to be noticed. And, and I think we've got a message that needs to be communicated at all times. I'm passionate about you industrial leaders out there and uh, but nonetheless you've got two books, two books, right? You've got writing for the brand, which is a great read by the way. It's, it's, you know, it, it, it. I, I cover to cover and I think I read it in a day. [44:16] Well and that it's designed that way. Yes. An airplane airplane you'll ever read by the time you get back and it's got, you know, the thing and I would do is I know that we've got just a little bit of time here. I want to share. Yeah. A, the other day I got a call from a young man, worked for an insurance company and he used to work for another insurance company that I had spoken to and done work with several years ago and not only did I speak to her, but I actually came in and I gave them the process of helping people discover their purpose in life. And he told me, he says, I'm no longer. The company says, I want you to know. He says, have you gotten feedback from the impact that you had on our company? He says, after we went through your process, he said we had people to discover their purpose and they actually left the company because it wasn't a good vehicle for them and he said it was good for them. [45:11] It was good for the company because we had other people that said, hey, this is a great vehicle for me, and he says, and that impacted me. He said, because I discovered my purpose in life, which is to have a positive impact on the lives of other people. Any told me that just on the phone, Scott. I hadn't talked to this guy in. It's probably been 10 years since I spoke to their company, but I thought how powerful is that? That he remembers what happened 10 years ago. The impact that it had on his company, his people and in his personal life and now the new company that he's with. He says, I've got to have you come in here and talk to us and it's got a. I'll bring it right back to whenever I met you. And of course the reason that you and I met was because I asked the people at Westway, I said, who can I use for a steer in my roping demonstration? The ugliest guy there he is. He looks like a steer. [46:13] They said, oh, we have the perfect candidate, isn't they've got with kids. I'm a legend, a legend, and you probably still remember when I dragged you up on stage. Of course you were completely unaware of it. It was an. It was a very important time in my life. No stop, no doubt. But I think about that because that was a seminal moment in your life because when you walked off that stage and you sat down and you started talking to me, you may have not known what you were going to do that you start telling yourself, I'm not going to do what I'm doing anymore. Because you knew you weren't fulfilling your purpose there. Scott, we, you and I need to create more Scott MacKenzie's out there. I agree. I, I understand that. It'll drive a lot of people crazy, but bunch of ugly, ugly guys running around there, but they have a heck of a purpose, but, but the thing about it is, is if we can do for other people what you discovered and what I've discovered and we can turn those people loose and organizations, we will transform. We will transform leaders and we will transform organizations. [47:35] I'll tell you what the listeners, I, I, I, you know, you've got to contact Jim Witt. It, it was a moment in my life that gave me clarity of where I, I'm still, I'm still fulfilling that purpose. Whatever it might be right now, and it changes over time, right? It could change over time. [47:55] Well, I, I've told people this purpose is your destination in life. It doesn't change your vehicles do. Yes, there you go. Your podcast is a vehicle. Well, you didn't have the vehicle five years ago, so when you created a leaf surfaces, you didn't have that vehicle, but you created that. So your vehicles, we're going to continually change. Your business model has to change. Your purpose remains the same. [48:40] the word real quick if you get both of the books. Yeah, but read riding for the brand first. Yes. Because when people get to the end of riding for the brand and I had a debrief it with leadership groups and I'd ask them what the theme was and I thought, well they tell me this about freedom and purpose driven organization. They always said it's about discovering your purpose in life. And I thought after they read that book, they were examining their own life. Yeah. And so if they read that first and if they get it, then you go to the transformational power of purpose. You're ready to start. The process of discovering your purpose in life, and I'll make a bold promise, is if you want to know what your purpose is and you go through the process that I've outlined in that book, you will discover, and when you discover it, your life will be come electric. You'll be like Scott MacKenzie. [49:34] You're fantastic, Jim. That is absolutely an incredible testament, so good out there. Do not hesitate. Get those books riding for the brand and a transformation power purpose. Got To do it. Make it happen. You can change yourself and you can change your company. You can transform it into something that is much bigger, grander, and, and fulfilling that purpose. So Jim, thank you very much. Really appreciate it. I know you're busy, man. I know you are. I can't think of anything I'd rather be doing right now talking to you on this podcast. Thank you very much. I think the listeners appreciate it and thank you very much for joining the industrial talk podcast. We'll be right back and I'll wrap it up with another glowing recommendation for Jim Witt. So stay tuned. You're listening to the industrial talk podcast network. [50:37] Alright, you industrial leaders out there, that was Jim Witt, dear, dear friend of mine, and you're saying to yourself, hey, I'm looking at you and a youtube out there and you got that video going on and I see that you got a dog. Yeah, I brought my dog to work today. Here's the podcast pooch. His name is Benny. All he does is I pad the sea just because I got to take care of him. Here he is. Look at him. He's a mud buddies. He goes to lovely muck. So anyway, you know how to get ahold of me. That's industrial talk.com. We're out there on facebook, linkedin, twitter, instagram. We're going to be highlighting food, of course, highlighting books. We're going to be promoting some of the best leaders that are in the industrial space and I'm so thankful that once again you joined, you've got to go out, get connected with Jim Witt and and make them a part of your. Whatever. You're good what you're doing individually. Company. Get Ahold of that guy because he will make you a better company. He will make you a better person in and highlight that necessity for a purpose. So thank you again. I will be contacting you next week. Steve Smith right here. We're going to be interviewing him on copyable number one bestseller. You get them on out there, so thank you very much and have a great weekend. Be Safe. Okay.